This is the story of a special Mellow Boards session. 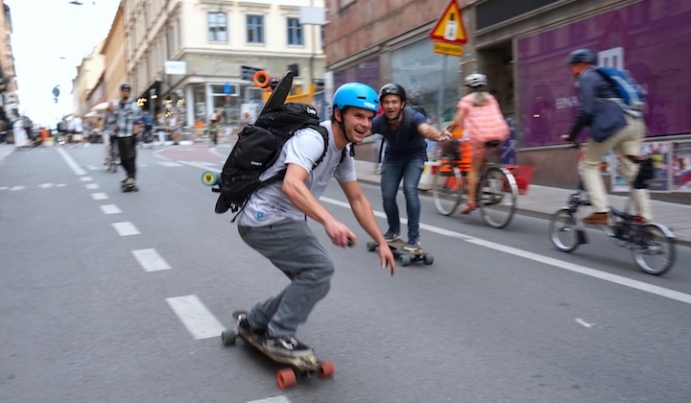 This is an electric skateboard session exploring a new frontier of skateboard freeriding. We took the core spirit of skating ditches and amplified it with the technology and freedom only a Mellow Drive can provide. To film such a fusion of the past and future we decided to film partially with 8mm film mixed with footage from a Sony a7ii. Get in your speed stance and get ready to blast off back to the future. Welcome to the MELLOWDROME. We have visited the ditch before. Last year we published images from a session with the Mellow staff that ended with a broken thumb. This time we return with some young rippers that truly live to ride and rode the Mellow in a way that only they could from all their experience with downhill longboarding. The crew consisted of the Gubbel bros Philipp Marx and Moritz Schallenberg and two Hamburg locals from Studio Longboard shop Erik Hilken and Alex Stamp. It took a little time to adapt to the mega transition walls but once everyone got warmed up and used to having lighting in their wheels the session was on. Each rider displayed creative original riding styles and approaches to this amazing dirty ditch with endless weaving lines and laps while trains rolled above our heads.